Dan Hardy hasn't given up on one last fight in the UFC and he's got a great idea of how to make it very special. 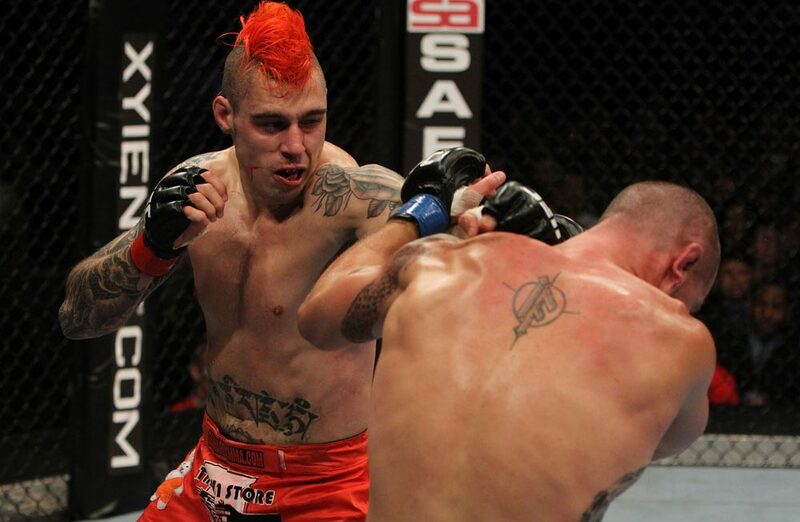 Dan Hardy hasn’t fought in the UFC Octagon since 2012, but “The Outlaw” still holds out hope that he will get the opportunity to put on the 4-oz. UFC gloves one last time. In 2013, Hardy was diagnosed with Wolff–Parkinson–White syndrome, a rare heart condition that prohibited him from being cleared to fight. After years of tests and through a lot of perseverance, Hardy last year got some of the top UK cardiologists to sign off on his return and he entered the USADA testing pool. This week on the Anik and Florian podcast, Hardy gave an update on his potential return and he confirmed the plan was still to have one last bout. “There is another fight for me, there has to be,” Hardy said. “I’ve been thinking about it for too long and it’s within me. I was stopped halfway through a training camp and I think all of that energy gets caught up inside of me and I need to have like an exorcism, I need to get it out. With that said, Hardy says that in the best case scenario he would be able to return to the UFC in a new weight class. With over 200 active fighters in the UFC’s lightweight and welterweight divisions, it would make a lot of sense for a new weight class to be introduced and Hardy is dreaming of him being the one to kick it all off. “What I would like to do, if I was day dreaming, I would like to introduce a 162-pounds weight class to the UFC roster,” Hardy said. “I think that would be an excellent stopping point between lightweight and welterweight for the guys like ‘Cowboy’ and dos Anjos to move through. Masvidal is another one. Then you have a few welterweights that are slightly too small, the likes of Gunnar Nelson and Mike Perry, Colby Covington could probably make 162. “We could have another weight class and we could make the most out of another champion. I think it would be a really fascinating and really competitive weight class. “What I would like to do is have the first fight at 162. You pick an opponent, there are a whole bunch of guys you could put in there, good veterans that would give me a good scrap. That was always my dream weight class. “I did 160-pounds a couple of times before. I was little smaller then, but I feel like I could make that weight class much more comfortably. When I was at 170-pounds I was too big, I was too slow.